Getting the capacity of the AC right is a must to enjoy a cool summer without it being a drain on your pocket. It is going to be a much hotter summer this year, according to the the Indian Meteorological Department. And so, it be comes all the more important that you pick an air conditioner (AC) whose capacity is just right to get the best cooling for your room at a reasonable cost. If you buy an AC with a lower than required capacity--measured in tonnage- it will consume a lot more energy to provide the requisite cooling. “Lower capacity units may save you on capital cost, but it will increase the electricity consumption and also decrease the life span of the device,“ says Varun Gupta, Partner, Kool Services, a Mumbai-based AC service provider. If you buy an AC with a higher than required capacity, you will end up paying more for the purchase, besides getting large power bills. Getting the tonnage right is key to getting the most bang for your buck. Here's how you can arrive at the right AC capacity for you and enjoy a cool summer--at no extra costs. First, find out your the area of you room. Then divide it by 600 to get the basic capacity. So, if you room is 100 square feet, the basic AC capacity required will be 0.167 tons (100 600). 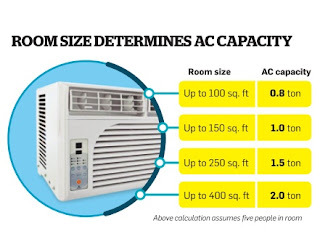 Now, you need to add 0.5 ton to the basic capacity for every five people in the room.Ordinarily, an AC of 0.8-ton capacity will work just fine for a 100 square feet room. There are a few additional factors you need to keep in mind. “If you stay near places where summers usually cross 45 degrees, you need consider adding 0.5 ton extra for effective cooling,“ suggests Ankit Chugh, Founder of Review Center India, a consumer electronics blog. “Also, if you stay on the top floor of your building, it is advisable to go for a little higher tonnage,“ suggests Gupta. To help you buy energy-efficient ACs, Bureau of Energy Efficiency (BEE) in 2016 came up with a new rating methodology, ISEER (Indian Seasonal Energy Efficiency Ratio) Ratings, which are better and stringent. Higher the star ratings of an AC, lesser the power it consumes. This, however, does not mean that you should always go for a 5-star rated AC, say experts.The decision should mainly be based on your usage pattern. “If you are going to run the AC for few hours daily, then a 3-star rated AC is good enough,“ says Chugh.Also, lower star-rated ACs usually have higher air circulation rate, so your room cools faster. Experts suggest that only if your AC usage is over eight hours do you need the costlier but less pow er consuming 5-star rated AC, to make a worthwhile difference to your electricity bill. Much like cars, ACs need regular servicing for optimum performance. So, one of the things you need to keep in mind before buying an AC is the company's aftersales service, and warranty. A little research will throw up names of the best and the worst service providers. Choose appropriately.